Heat vinegar, sugar, salt and pepper until dissolved (either in microwave or on top of stove). Put oil in quart jar and add heated ingredients. Shake to mix, refrigerate. Pour amount needed on cabbage mixture shortly before serving. Dressing keeps for weeks in refrigerator. 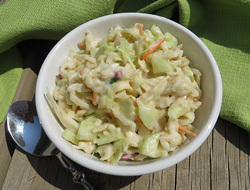 Note: Coleslaw keeps in refrigerator for 2 to 3 days.